This year marks the 10th anniversary of ARM as a diversified mining company. Over the years we have invested significantly in the growth of the Company and have created value for our shareholders and benefited our diverse range of stakeholders. In the financial year under review ARM increased headline earnings by 10% to 1900 cents per share from 1735 cents per share. The dividend paid increased by 18% to 600 cents per share and it is the eighth consecutive year in which we have paid dividends to our shareholders. The higher headline earnings were mainly due to a weakening of the Rand against the US Dollar together with increased sales volumes in copper, chrome concentrate, PGMs, manganese alloy and nickel. These headline earnings were reduced by inflation related cost increases and the increased operating costs at Lubambe Mine, which is in ramp-up. The containment of costs remains a key focus as we strive to ensure that all operations are positioned below the 50th percentile of each commodity’s global cost curve. The positioning of ARM’s operations in this regard is outlined in the graphic below. Volume growth and improvement in operational efficiencies delivered a reduction in the unit production costs at Nkomati and Dwarsrivier mines of 3% and 2% respectively, while Two Rivers Mine managed to keep unit production costs flat relative to the corresponding period. Cost increases at the iron ore, manganese ore, manganese alloys, Modikwa Platinum and coal operations were above inflation. The manganese smelters continued to operate below capacity due to depressed manganese alloy prices. The Machadodorp and Cato Ridge operations remain positioned above the 50th percentile of the global cost curve despite a number of cost saving initiatives that have been implemented. The ARM and Assore Boards will review the strategy for the smelters in the year ahead. We remain committed to creating a safe and healthy working environment for all our employees. It is pleasing that the number of lost-time injuries reduced from 149 in F2013 to 106 in F2014 and nine of our operations had no fatal accidents. Regrettably there was a fatal accident at the Modikwa Mine on 3 June 2014. On behalf of the ARM Board and management I extend my deepest condolences to the family and friends of our deceased colleague. The diverse, multi-racial and multi-ethnic nature of our workforce benefits and enriches our company and the mining industry. We are committed to ensuring that our employees are adequately and competitively remunerated. We have over the years, introduced various schemes and initiatives which are aimed at improving the living conditions of our employees as well as promoting home ownership amongst them. The trade union organisations that represent our employees are crucial to maintaining a mutually respectable and beneficial relationship with our workforce. We are proud of the constructive engagements we have had with these unions and in recent months concluded wage negotiations with the National Union of Mineworkers (NUM), the Association of Mineworkers and Construction Union (AMCU), the National Union of Metal Workers SA (NUMSA), Solidarity and the United Association of South Africa (UASA) with minor disruption at our operations. In F2014, the Company’s overall employment equity performance remained ahead of the 2014 Mining Charter targets. We continue to invest significantly in the development of our workforce and in the year under review spent R196 million on various skills development programmes including training courses, learnerships and internal and external bursaries. We continuously engage and consult our stakeholders and in particular the communities neighbouring our mines, to ensure that they participate and benefit from our mining operations. During the year R283 million was invested through our Corporate Social Investment (CSI), Local Economic Development (LED) and Social Labour Plan (SLP) projects. These projects are focused on education, health, agriculture, roads, water and other infrastructure. In addition, as part of our commitment to the broader South Africa, the ARM Broad-Based Economic Empowerment Trust (ARM BBEE Trust) has distributed R110 million since inception to a broad base of poor and historically disadvantaged beneficiaries which include rural upliftment trusts, church groups, trade union and women upliftment trusts. The ARM BBEE Trust works closely with traditional and local community leaders to ensure that projects undertaken by the rural upliftment trusts are those identified by the local communities as being the most beneficial developmental and upliftment projects. ARM is committed to adhering and implementing global best practices in relation to protecting and conserving the environment and rehabilitating the land where we operate our mines. We are a member of the International Council of Mining and Metals (ICMM) whose sustainable development framework guides ARM’s initiatives pertaining to the continuous improvement in environmental management. We recognise that our businesses have both a direct and an indirect impact on the environment and remain committed to minimising our environmental impact and being responsible in our use of scarce natural resources. Our major focus areas include responsible water management, climate change and the efficient utilisation of energy to reduce our carbon emissions. Further details of our sustainability initiatives and the Company’s performance in this regard are contained in our detailed Sustainability Report, which can be found on our website. After the commissioning of the vertical shaft at the Lubambe Copper Mine in November 2013, tonnes milled increased by 49% and copper produced was up 60% compared to the corresponding period. The mine remains on track to achieve steady state production of 45 000 tonnes per annum by F2016. The Lubambe Extension Area (Extension Area) provides a promising opportunity for the expansion of the Lubambe Mine. Additional surface drilling completed in the Extension Area has indicated that the ore body extends even further east than originally expected and an updated mineral resource statement has increased the Extension Area’s indicated and inferred resources from 105 million to 134 million tonnes at an in-situ grade of 4.07% copper. We approved the Black Rock Mine Expansion Project which is expected to increase manganese ore production from 3.2 million to 4.6 million tonnes per annum. The project involves the exploitation of the Seam 2 resource within the Nchwaning lease area to improve cost-effective extraction of high-grade manganese. This project will be developed in two phases. The first phase involves maintenance and modernisation of the mine to reduce annual unit cost escalations. The second phase is the expansion. Capital expenditure for the expansion phase will be in alignment with Transnet’s growth in the manganese ore export channel. The Sakura Ferroalloys Project in Malaysia is also progressing well and remains on track to achieve the steady state of 170 000 tonnes per annum in F2017. Capital expenditure to 30 June 2014 was R790 million. ARM and Assore together own 54% through Assmang which is the largest shareholder in the Sakura Ferroalloys project. Commodity prices are expected to remain flat or decline; accordingly ARM will review all capital expenditure and focus on reducing costs. The five month platinum strike in the Western Limb was a stark reminder of the crucial importance of building a mutually respectful and beneficial long term relationship between labour and management. Industrial action and labour unrest is not in the interest of either party. The most successful mining countries are those that have created a globally competitive and attractive business environment for the private sector and other investors in their mining industry. Key aspects of such an environment includes certainty around fiscal, labour and governmental policies. The South African mining industry is committed to continue working with government, labour and all stakeholders to ensure that the mining industry remains a competitive and attractive investment destination. In my discussions with the various ministers and governmental representatives, their commitment to creating a globally competitive mining and investment dispensation in South Africa has been consistently emphasised. Volatility in commodity prices is expected to persist in the short to medium term. Although the United States and some European countries have shown signs of improved economic health and China remains supportive of demand for our commodities, a number of commodities face supply related headwinds and in particular lower and flat prices should persist in the short term. Of most concern is the significant fall in iron ore and manganese ore prices. Iron ore prices are expected to remain under pressure and this is expected to negatively impact our earnings in the coming year. ARM produces high quality iron and manganese ores that remain in strong demand and sell at a premium. As pollution concerns in China are addressed demand for our high quality iron ore and manganese ore as well as PGMs is expected to increase. Capital within ARM is allocated based primarily on increasing profitability and productivity at all our operations through volume growth, plant optimisations, technology and the continuous training of our people. South Africa’s local rail transportation utility, Transnet, initiated its Market Demand Strategy in 2012 which will result in increased bulk commodity export capacity. This will present an opportunity to further optimise the iron and manganese ore operations. We expect challenging times in the short to medium term; particularly in relation to the prices of some of the commodities we produce. 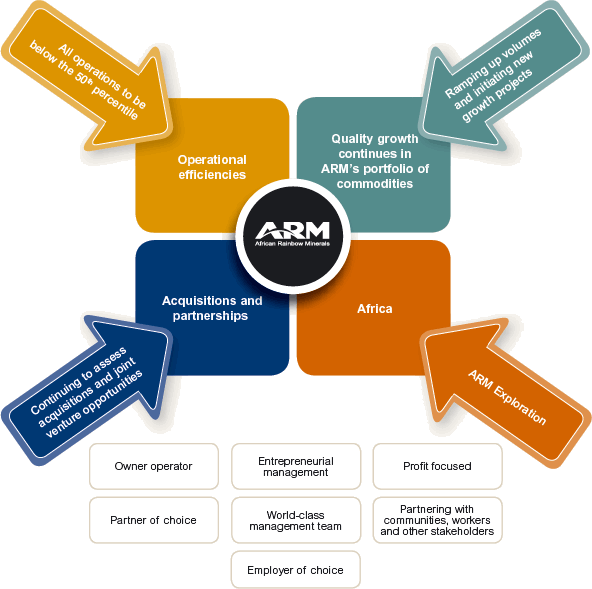 We are however confident that ARM’s strategy of focussing on quality growth within our diversified portfolio and ensuring that all operations are positioned below the 50thpercentile of the global cost curve will continue to make ARM competitive and create value for its shareholders. We have included the ARM strategy diagram which reflects our strategy of creating competitive value for our shareholders and benefiting all our stakeholders. Our strategy is also supported by the high standards of corporate governance which we continue to review to ensure robust controls and alignment of our businesses with global best practice. Our success during the past financial year was achieved and based on the hard work and commitment of all our employees and I would like to express my deep appreciation to all of them. We value the good relationships that ARM has built over the years with all our stakeholders. We are proud of the partnerships that we have built with our host communities, local and national governments and firmly believe that our capacity to succeed is significantly influenced by our ability to improve the living conditions and quality of life of the communities living near our mines and benefiting our broad range of stakeholders. ARM remains on track to continue building a competitive and sustainable portfolio of mining assets that creates value for all its shareholders and stakeholders. I wish to thank our world class management team under the leadership of Mike Schmidt. I also would like to express my gratitude to my fellow directors for their outstanding contributions on the Board.